Protection of personal data/protected health information (PHI)/personally identifiable information (PII) is important to Indegene and its clients. This policy is intended to be shared with our clients, vendors, business associates and employees so that they are aware of the policies and practices with respect to personal data/PHI/PII managed by Indegene as part of any services delivered. Applicability: This policy is applicable to all personal information processed at Indegene. Ongoing Compliance: The Data Protection Cell shall be responsible for Indegene's compliance with this policy. Cognizance: This policy shall be made available to all employees and associates of Indegene as documented information and shall also be communicated appropriately. This policy shall be made aware to all of Indegene's employees, its associates, and interested parties effectively. Review: This policy shall be reviewed at least once annually. This policy applies to all personal data/PII and PHI processed by Indegene. This policy would be relevant to all applicable services or projects managed for Indegene's clients. Refers to the agreement between the business associate (Indegene) and the covered entity. Refers to different departments in Indegene. Refers to an organization that routinely handles personal information, PII, and PHI. Refers to the person heading all data privacy-related programmes and initiatives within the organization. Refers to the project, programme or engagement conducted or performed by Indegene on behalf of its clients or covered entity. Refers to all individually identifiable health information that is created, maintained or transmitted electronically. Legal framework that sets guidelines for the collection and processing of personal information of individuals within the European Union (EU). Act of 1996 that specifies laws for the protection and use of personal (or protected) health information (PHI), which is essentially an individual's medical records. Refers to any data that could potentially identify a specific individual. Any information that can be used to distinguish one person from another and can be used for de-anonymizing anonymous data can be considered as PII. Any information about an individual's identity such as their name, social security number, date and place of birth, mother's maiden name and biometric records can be considered as PII. PII also can constitute “PHI” under HIPAA Act of 1996. Refers to the part of the HIPAA rule that addresses the saving, accessing and sharing of medical and personal information of an individual, including a patient's own right to access. The past, present or future payment for healthcare. Refers to the person monitoring the personal data/PII/PHI management under each BU. Refers to the part of the HIPAA rule that outlines national security standards intended to protect health data created, received, maintained or transmitted electronically. Refers to the single point of contact/point persons. Preselected website that can automatically send updated information for immediate display or viewing on request. Data privacy cell consists of DPO and all the BU-SPOCs. The summary of proceedings of data privacy governance shall be discussed in the quarterly Information Security Group review meeting. In the instance where Indegene collects personal data/PII/PHI about an individual, measures shall be taken to respect the privacy preferences of the individual. Personal data/PII/PHI is collected from participants in an engagement who access Indegene websites, portals, platforms, etc. We may collect additional information relating to an individual's participation in Indegene programmes. Please note that we also collect personal data/PII/PHI relating to an individual at the time of enrolling in an Indegene programme, as well as in the course of allocating and issuing a unique ID and password to access the Indegene websites, portals, platforms, etc. When an individual visits an Indegene website, we automatically collect and analyze certain information about the individual's computer. This information includes, but may not be limited to the Internet Protocol (IP) address used to connect the individual's computer to the Internet, information about the browser type and language, the date and time the individual accessed the website, the content of any undeleted cookies that the browser previously accepted from Indegene and the referring website address. We use various technologies to collect information on an Indegene website. Cookies: When an individual visits an Indegene website, we may assign the computer one or more “cookies.” A cookie is a small text file that contains information that can later be read by Indegene to facilitate access to the site and personalize the online experience. For example, when an individual signs into an Indegene site, we may record his/her user ID in a cookie file on the individual's computer. In addition, through the use of a cookie, we may automatically collect information about the online activity on Indegene site, such as the web pages visited, the links clicked and the searches conducted. Most browsers automatically accept cookies; however, an individual can usually modify the browser setting to decline cookies by visiting the Help section of the browser's toolbar. 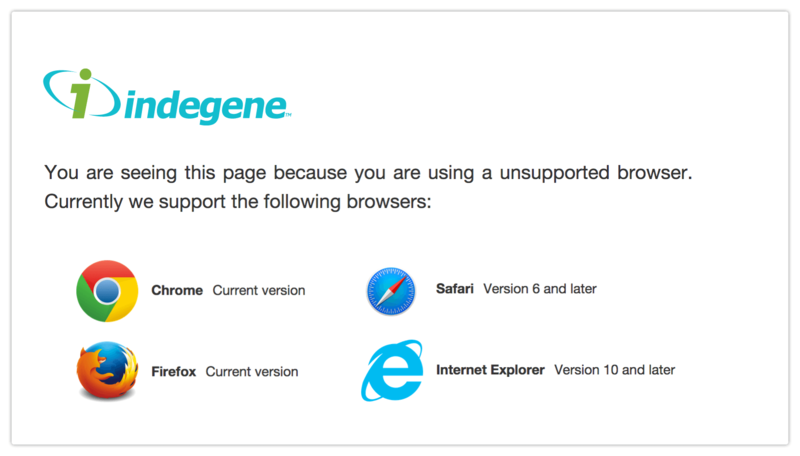 If an individual chooses to decline cookies, please note that he/she may not be able to sign in or use some of the interactive features offered on Indegene websites. The scope of business at Indegene does not require us to disclose personal data/PII/PHI to any parties out of designated programme area except for legal and statutory obligations. Information about an individual's computer, visits and the use of Indegene websites, such as IP address, demographics, computer's operating system, and browser type and information collected via cookies. We may combine personal information we obtain through online channels with information we obtain through offline channels, as well as other information, for the purposes described above. We may anonymize or aggregate personal information and use it for the purposes described above and for other purposes to the extent permitted by applicable law. We also may use personal information for additional purposes that we identify at the time of collection. We obtain the individual's/data subject's consent for these additional uses to the extent required by applicable law. If an individual/data subject chooses not to provide their personal information that is mandatory to process a request, then, Indegene may not be able/restricted from providing the corresponding service. We process personal data/PII/PHI when it is necessary for the performance of a contract to which the individuals/data subjects are the party or in order to take steps at a request prior to entering into a contract. This applies in any case where we provide services to a client in pursuance to a contract, such as when an individual/data subject uses our website or processes for registration on the websites/online channels. In general, our clients are the data controllers responsible for processing the personal data/PII/PHI. We transfer personal information to countries outside the EEA (generally referred to as third countries) only if included in our contractual agreement that we have signed with the client, including to countries which have different data protection standards to those which apply in the EEA. Our service providers are primarily located in the United States, Singapore, India and the United Kingdom. Where service providers process personal data/PII/PHI in countries deemed adequate by the European Commission, we rely on the European Commission's decision to protect personal information. For transfers to Indegene group companies and service providers outside the EEA, we use standard contractual clauses or rely on a service provider's Privacy Shield certification or a service provider's (EU Data Protection Authority approved) corporate rules that are in place to protect the personal data/PII/PHI. When required, Indegene discloses personal data/PII/PHI to external law enforcement bodies or regulatory authorities to comply with legal obligations. Data subjects have the rights to request access to correct, delete or transfer personal data/PII/PHI that we hold, including profile and preferences. Data subjects also have the rights to object to certain processing and, where our client or we have asked for the consent to process the personal data/PII/PHI, to withdraw this consent. Where we process the personal data/PII/PHI because we have a legitimate interest in doing so, data subjects also have a right to object this. These rights may be limited in some situations, for example, where we can demonstrate that we have a legal requirement to process the personal data/PII/PHI. Data subjects can assert their rights where such information was provided by contacting us at privacyofficers@indegene.com. Indegene adopts reasonable and appropriate security practices and procedures including administrative, physical security and technical controls to safeguard the personal information. We take precautions including organizational, technical and physical measures to help safeguard against accidental or unlawful destruction, loss, alteration, unauthorized disclosure of, or access to, the personal data/PII/PHI we process or use. Indegene will retain the personal data/PII/PHI as per the project/programme agreement. On the completion of agreed period, the data shall be archived/destroyed/transmitted to client according to the regulatory norms. If the client wishes to retain the personal data/PII/PHI, the client's employee identified in the statement of work or service agreement should request for the data in writing. Indegene will provide the data in the prescribed format. Reference document: Sections 6.5 and 8 of Indegene Information SOP For Indegene Information Lifecycle Document. We do not knowingly collect personal data/PII/PHI from children under the age of 16. If the parents or guardians believe that their child/ward has provided us with personal data without their consent, such parents or guardians can contact us at privacyofficers@indegene.com and we will take steps to delete such personal data/PII/PHI from our systems. Restrictions on automated processing of data and decisions based solely on automated processing without human intervention (which could include profiling) shall apply if the decisions produce legal effects or similar significant effects on the data subject, individuals have a right to object to automated decision making.